Brussels: The European Union’s (EU) trade chief cited progress at the World Trade Organization (WTO) and said she expected a minister-level meeting on the stalled Doha Round within the next three weeks. 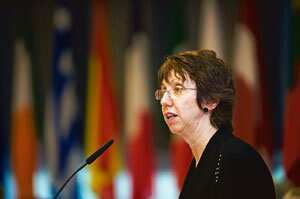 EU trade commissioner Catherine Ashton said on Tuesday there was a better chance of a breakthrough in the world trade talks now than when they collapsed in July, but said any deal would require greater flexibility from the US and India. “There should be a ministerial within the next three weeks. I am more than 50% certain that we will have a ministerial," Ashton said in an interview. “The impression I am getting from my ambassador at the talks is that they are beginning to work through some of the detailed questions. There are no solutions yet, but real progress is being made," she added without specifying the areas in which progress had been made. There has been growing political pressure over the past week for a meeting of ministers to end the deadlock in the long-frustrated global free trade talks, but until now progress by negotiators at the WTO in Geneva had appeared scant. Earlier this month, the G-20 industrialized and developing nations called for an outline Doha deal by the end of the year. “The big difference between July and now is the statement of the G-20 and the political will around the globe linked to the economic downturn," Ashton said. “It is much more likely now we can achieve a breakthrough than in July." The Doha Round was launched in the Qatari capital seven years ago to open up world trade and help developing countries export their way out of poverty. But the talks to free up trade—estimated to be worth hundreds of billions of dollars—were frozen in July when the US and India disagreed over measures to protect poor-country farmers from a surge in imports. “As we know the talks fell down on an issue between the US and India. But they are both aware of their responsibilities and I hope because of the economic climate, people will come with additional flexibility in their minds," she said. “Both President George Bush and Indian Prime Minister Manmohan Singh signed the G-20 declaration and their trade officials said they want to be keen participants. They have indicated a strong desire to do it," she added. Ashton also dispelled concerns that US President-elect Barack Obama does not support a deal as much as Bush who steps down on 20 January. “I am confident Obama is watching carefully and both the Bush and Obama administrations are working together. We are also working with them both, but we are not going to wait and we must get on with this as quickly as possible," she said. Ashton took over from her predecessor Peter Mandelson last month and her comments underline her determination to follow him as a strong advocate of the round. She also clearly signalled that the 27-nation bloc continued to support Russia’s entry into the WTO as quickly as possible despite a series of disputes between Brussels and Moscow. “Talking to Russian ministers they seem quite keen to try and achieve WTO membership urgently. How quickly we can achieve that I don’t know," Ashton said. “But we have pledged our support in order to do it." Russia, the world’s 10th largest economy, is the biggest country outside the WTO—the watchdog which sets rules for global trade. The EU said last week that plans by Russia to increase duties on imported cars could harm its WTO bid.